In teaching His disciples about heaven, Jesus said, “I go to prepare a place for you.” But what did Jesus mean? In this series, R.C. 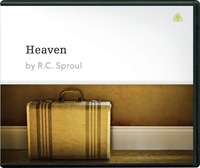 Sproul provides clear teaching about heaven, explaining that Christians have the greatest hope — the hope of glory. In examining Scripture, he shows that heaven is the home of God’s chosen people, the church.